Weve gotten it all wrong. For years now weve been told by "them" that the best investments in audiophile-grade components are those touted as "future-proof." These home-theater processors, DACs, speakers, and other products are typically modular in construction and offer the promise of future upgradeability -- which makes them supposedly immune to any changes that might come as a result of progress. Many of us have bought into this myth -- but the mere fact that these components might need upgrading means that they cant ever be future-proof. Dont believe the hype: theres simply no way to anticipate advances that have yet to be discovered. Buy products based on their performance today. Theres a very good likelihood that what you get today is what youll be stuck with for years to come. Heres something thats truly future-proof: a good shovel. Buy a well-made shovel at your local hardware store and it will serve you ably for many years. A hardwood-and-steel shovel will last virtually forever, as long as you take care of it: dont bang it up too much, hose it off after each use, and store it in a dry place. Maybe best of all, a shovel never needs upgrading -- as far as I know, the design is pretty much set in stone. Theres been no need to fix what aint been broke. So while weve been told that the most technologically advanced components are the ones that can be adapted to future developments, perhaps its the most mature technologies -- those not in flux at all, or even those that are most simplistic in nature -- that are the ones that are future-proof. The future can adapt to them. Im no vinyl aficionado, but it could be reasonably argued that the turntable is the most future-proof audio component of all. If you buy a good one today, it will be good for the rest of your days. 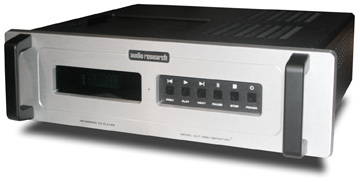 Audio Research Corporations Reference CD7 CD player ($8995 USD) came to me at a great time. I was starting to experiment with computer-based digital audio via an Apple MacBook and a Stello DA220 Mk.II USB DAC, and was still enjoying a universal (future-proof? OK, gotcha) A/V player as the primary source in my stereo system. Before I even connected the CD7, I was thinking about why such a player had been brought to market today, and who might buy it. Here is a $9000 machine that plays only CDs, supports none of the high-resolution audio formats, doesnt do video at all, isnt promoted as "upgradeable," and uses vacuum tubes. 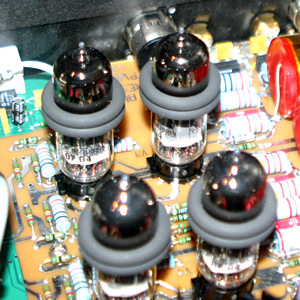 The Reference CD7 uses tried-and-true technology from the vaults of the Audio Research brain trust: seven 6H30 triode tubes, a gain stage taken directly from the very successful REF3 preamp, a Crystal 24-bit DAC, a Philips CD-Pro2 transport mechanism, and capacitors developed especially for ARCs Reference line. In other words, all of the ARC goodies are in there. In fact, those who follow ARC lore should note that the CD7 is the first CD player to earn the companys Reference designation, heretofore worn only by amplifying components. In short, the Reference CD7 is ARCs statement CD player. The look is classic ARC: a 19"W x 5 1/4"H x 15 3/8"D case with a brushed-aluminum faceplate in silver or black, with cutouts for the display (green numerals) and pushbuttons for the basic functions; a top-loading CD transport with a manually retractable cover; balanced and single-ended outputs; and an IEC connector for the power cord. 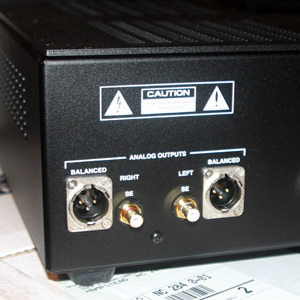 The CD7 also has two digital outputs (AES/EBU, coaxial), for use with an outboard D/A converter. One slight disappointment is the lack of a digital input; it would be nice to have the ability to use the CD7s DAC section with another source (such as a computer). The CD7 weighs 32.5 pounds. 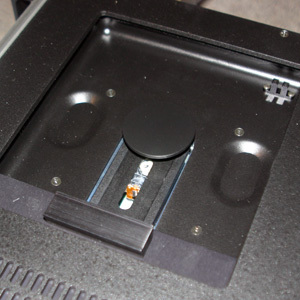 On unpacking the CD7, youll have to remove the top cover (wrench included) and insert the tubes in their sockets. The tubes are stored inside the player in taped-up foam for safe transport, each one labeled for its respective socket; inserting them took no more than five minutes. My system included the Simaudio Evolution P-8 preamplifier and Vitus Audio SS-101 power amplifier. I used XLR cables from Shunyata Research to tie the components together. Speakers were, plentiful, as has been the case in the Music Vault for the past two years: Paradigm Reference Signature S6 v.2s, German Physiks HRS-120s, and Rockport Technologies Altairs. 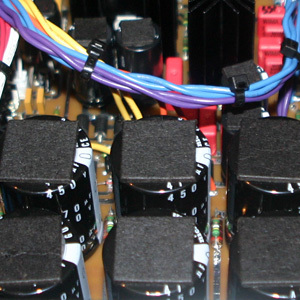 Power conditioning was handled by a Shunyata Research Hydra V-Ray. Do I hear the future, or . . . ? Listening to the Reference CD7 was not an immediately revelatory experience. Ive had "epiphanies" with certain components, several of which have eventually proven misleading. Ive sometimes grown tired of components that make strong initial statements; in those cases, over time, Ive come to realize that the immediate positive impact of some aspect of the performance was not what I found satisfying over the long haul. So I wasnt disappointed that the CD7 didnt blow me away; in fact, I wasnt disappointed at all. My first few days with the CD7 reminded me more of a simple handshake from an honest person: outwardly there wasnt much to it, but there was an earnestness to the introduction that would prove quite gratifying over the weeks to come. A good place to start in describing the CD7s sound is with the minimalist acoustic guitar strumming in Bruce Cockburns "Isnt That What Friends Are For?," from his Breakfast in New Orleans, Dinner in Timbuktu [Rykodisc RCD 10407]. The natural tone, detail, and presence of the instrument was hard to fault, and the CD7s presentation of it pulled me into the performance. The guitar was perfectly balanced with the voice -- when Cockburn begins speaking the lyrics, the two elements were properly scaled and separated in the soundstage. There was no digital overlay to the sound that made me think the recording was being "processed" by the system in any way. Perhaps those tubes were counteracting the digital nature of the recording -- or, more likely, the CD7 just had such a graceful way with the music that I was hard-pressed not to like what was coming from it. Either way, vocals such as Cockburns, and those on the most natural-sounding recordings in my collection, had full helpings of body, warmth, and presence. This was something I grew to appreciate the more I listened. I heard no artificial spotlighting in the vocal range; in fact, artificial is not a word I would apply to any aspect of the CD7s sound. The highs werent grainy, but had excellent decay and tonal accuracy. If youve heard the term white-sounding applied to some components, just think the opposite and youll have an idea of what the CD7 was doing. The Reference CD7 allowed the soundstage in Diana Kralls All for You [Impulse! IMPD-182] to bloom naturally in my room, and presented her physical outline in appropriate scale. The sound didnt jump out as overly incisive or pulsing, but instead flowed freely, and was easy on the ears. Nor was the sound soft or indistinct; its just that it didnt have the sort of artificial, hyperreal detail that can sound impressive at first, but is fatiguing in the long term. Kralls voice still sounded dry on some tracks and had a bit more zest on others, which is whats on the recording -- its her style. The details were there too. The CD7 is a "resolving" player, just not extremely so. You wont miss any of the fine points on your recordings, but they wont jump out at you either. In this way, the CD7 was one of the most well-balanced components Ive ever heard. The Esoteric UX3-SE has served as my reference source player for a couple of years now. For $8250 you get a machine that will play SACD, DVD-Audio, and standard-definition DVD-Video, has such proprietary features as the VRDS-Neo transport mechanism (which Esoteric manufactures), and is built to extremely high standards (it weighs over 50 pounds). Ive really enjoyed it, and have recommended it to friends and colleagues and not heard a single complaint. As far as functionality with various types of disc, the UX3-SE has it all over the Reference CD7 -- it simply does a lot more. But if youre ambivalent about multichannel audio and high-resolution audio formats, those advantages will mean little to you. If, instead, youre simply looking for the best CD playback you can get, then the ARC Reference CD7 is a contender. The Reference CD7s sound is just a touch more natural and harmonically rich than the Esoteric UX3-SEs. I heard a bit more warmth and palpability with stringed instruments, which made them sound more "analog" than "digital." Images had more bloom through the CD7, and just felt a bit more like live music. This quality is hard to describe but was not hard to hear. The ARC shone particularly well on acoustic music and recordings that were minimally miked and processed. On the other hand, the UX3-SE had a more vise-like grip on the music, with more visceral drive and pacing, and perhaps a bit stronger bass slam. The Esoteric was also a touch more resolving of low-level details -- you might prefer it with synth and electronica. But eventually I came to the conclusion that, with most of the music I listen to for enjoyment, the Reference CD7 painted a slightly more complete musical picture. It just sounded more honest to my ears, seeming to structure music more in its natural form. It didnt seem to "process" the sound at all, but instead let things just flow along. At the end of the day, the ARC and Esoteric are both very good players at about the same price that will suit different listeners. The comparison might smack somewhat of apples-to-oranges -- the Esoteric isnt strictly optimized for CD playback -- but that doesnt change my conclusion: If I were buying something on which I would play only CDs, Id take the ARC Reference CD7. By the end of the review period, Id come to appreciate that the beauty of music came through the Reference CD7 completely unfettered. The ARC provided a wellspring of enjoyment with my CD collection. It wont stand out on your rack as something obviously extraordinary, but it wont be something youre constantly looking at upgrading to fix some deficiency, either. The fantastic vocals of Karen Casey singing the title track of her Distant Shore [Shanachie 78053] almost gave me shivers. Her traditional Irish, sing-song style was on pace, with the intact vocal inflection that makes the song skip along. The CD7 was right at home with real acoustic instruments and unprocessed vocals, the true tests of high-end equipment. If you have a large CD collection on your shelves, arent inclined to rip them all to a hard drive (read: enjoy the physical media, or dont trust computer technology for long-term reliability, or simply dont have the time to be messing with uploads, downloads, etc. ), and if youre OK with spending almost nine grand on a CD player, you should add the Reference CD7 to your audition list. It probably is for you if you value natural, honest sound over hi-fi hijinks. Im listening to Nickel Creeks "Out of the Woods," from their eponymous first album [Sugar Hill 3909], and the harmonies are just perfect. I couldnt ask for more. The sound quality offered by the Audio Research Reference CD7 is outstanding in the here and now. I hypothesize that it is components like the CD7 that stretch the limitations of the "Red Book" CD format, and not the other way around. That makes the CD7 about as future-proof as you can get in todays audiophile marketplace. Consider it the ultimate sonic shovel for those wishing to maximize the sound of their CDs: Take care of it, and itll serve you in a way that youll appreciate for years to come. If you turn out to be the lucky owner of one, my guess is that you wont be tempted to upgrade it for some "future-proof" thingy. ARCs Reference CD7 will be long remembered as a solid musical investment in our seemingly ever-changing hobby.